Brampton Plate Pressure Products can supply a range of shell and tube types of heat exchangers. The very basic type is the 'U'-bend tube type. 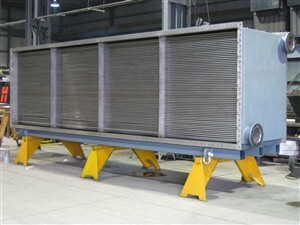 This is a very economical exchanger used to heat or cool a product. Physical sizes range from a 4" to 30" diameter. The length of these exchangers can be from 2 feet to 20 feet long. Other types are the fixed or floating type of tube bundle. These are used when the product is fouling or viscous fluids. The tubes can be easily serviced for cleaning clogged tubes. Physical sizes range from 4" to 40" diameter. The length of the exchangers can be 2 feet to 30 feet. Brampton Plate Pressure Products replacement bundles are made to fit existing shell. These are made in carbon steel, copper, 90-10 copper nickel, 304 or 316 stainless steel and brass tubes. Tube diameters are 5/8", or 1" in 14, 16 or 18 gauge wall thickness. 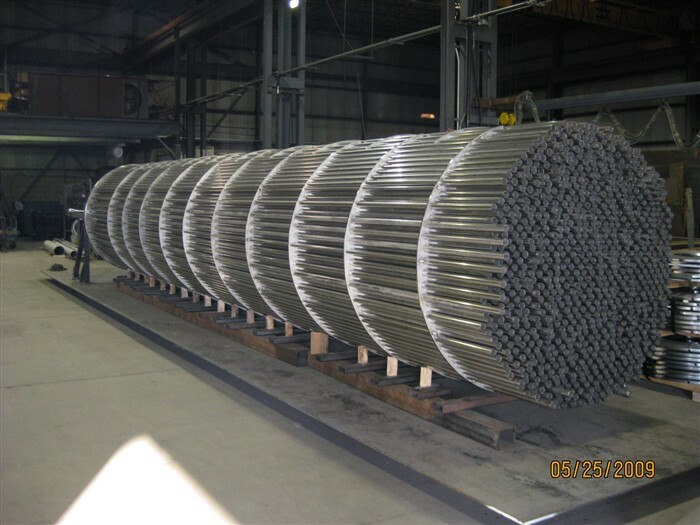 The tubes are mechanically rolled into tube-sheet. When additional seal is required the tubes can be seal welded or strength welded. Tube-sheet is made in PVQ-carbon steel, 304/L, 316/L or Navel Brass. The tube-sheet can be provided with double or triple groove for additional strength and sealing. Baffles are made in mild steel, or 304/L, 316/L or other materials of choice. Shell is made in carbon steel or 304/L, or 316/L pipe sizes to 24" and 20 feet long. 22" diameter and up are made in rolled plate. Head configuration in flat type or Bonnet and Channel style. All exchangers are configured and built to ASME VIII Division I and TEMA Types C, B, R.
Pressures and design temperatures are as used on application. Generally the requirements are 150, 300 or 600 PSI and temperatures range from 100 to 650 degrees Fahrenheit. Brampton Plate Pressure Products can supply a range of pressure vessels. Physical sizes: from 6 diameter to 144 diameter. Thickness: 3/16" to 2" thick plate. Pipe sizes are available from 6" to 24" in diameter. Vessels can be made from PVQ SA-516-70 Steel Plate, or SA-240-304/304L Stainless. Also available in SA-240-316/316L Stainless. Vessels can be horizontal or vertical. Supports can be saddle type supports or legs supports. Lifting lugs or tailing lug provided as per design requirements. 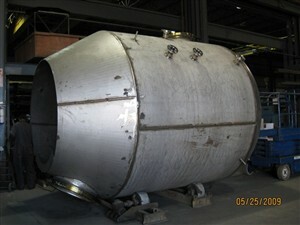 Vessels are designed and built to ASME Section VIII Division I or Non Code to customer specification. Pressure and design temperature to range from 150PSI to 600 PSIG and temperatures from 100 to 650 degrees Fahrenheit. When contacting Brampton Plate Pressure Products please ask for David.